It’s emitted by the linker in Visual Studio 2015 and later. The linker calls it “COFF group information” and you can prevent this directory from being emitted by specifying the additional linker option /nocoffgrpinfo. Link Time Code Generation (AKA Whole Program Optimization) produces better code quality as we have additional whole program optimization to further optimize the code leveraging the bigger picture of the entire program that is only available during LTCG. LTCG is great for code quality, and it’s the foundation for Pogo; however throughput is its downside and developers today have to wait for full clean LTCG build times even on making trivial edits. This often kills the popularity of this feature and developers today are forced away to throw these extra performance improvements away in favor of productivity. – as explained here. Still don’t know what is a full meaning of the data, but hopefully structures are already documented somewhere. 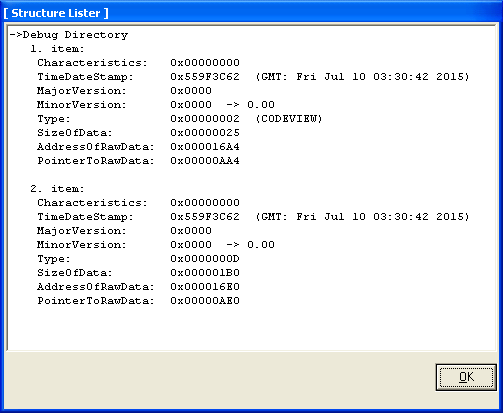 While looking at the Windows 10 binaries I noticed it contains an extra debug section marked as ‘GCTL’. I don’t know what is the purpose of it and after asking on Twitter Reversing on Windows suggested it could be “Garbage Collection Table “.